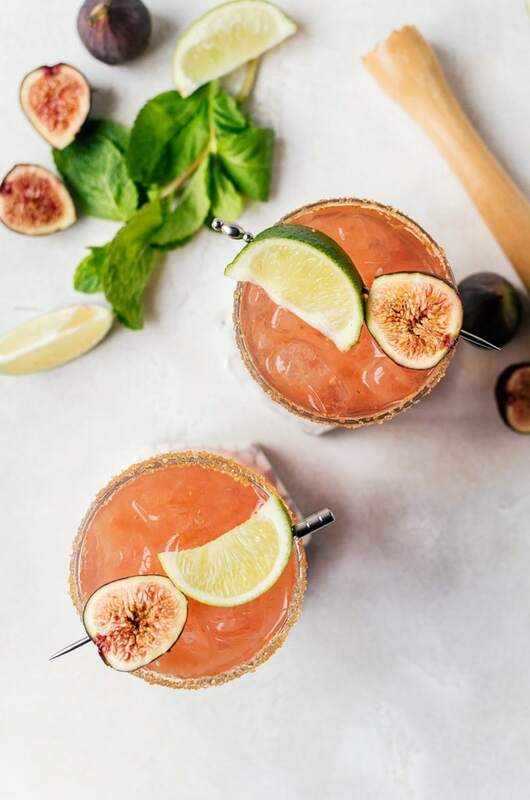 There is no better way to relax than with a fresh fig margarita. 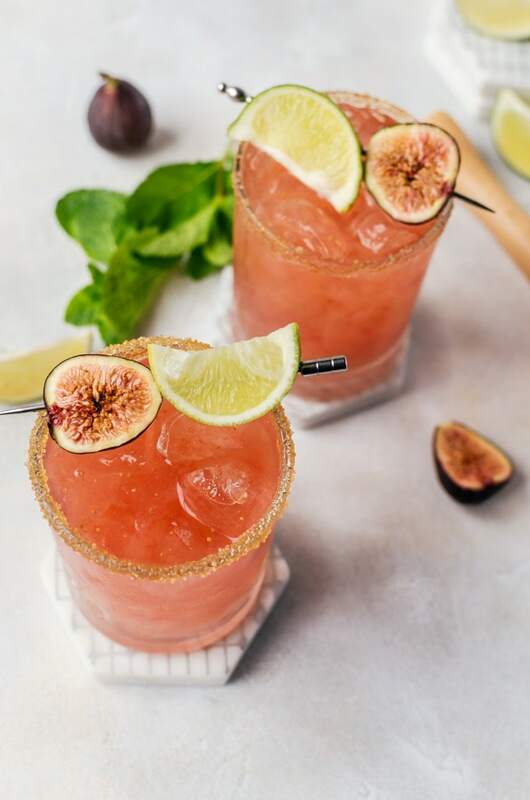 This delicious crowd-pleasing fig cocktail is a cinch to make for yourself or for a crowd! 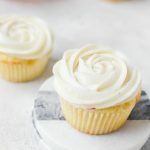 There is something incredible about when bloggers get together to share recipes as a group. I try to join whenever possible. 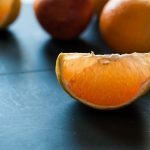 You may have noticed that I’ve been sharing more and more cocktails on the blog lately like the blackberry prosecco mojitos and blood orange margaritas. 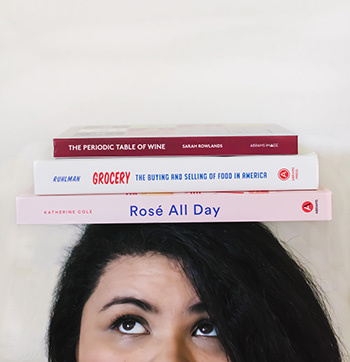 I am continuing that trend by joining up with some incredible ladies for Margarita Week hosted by Kate from Hola Jalapeno. 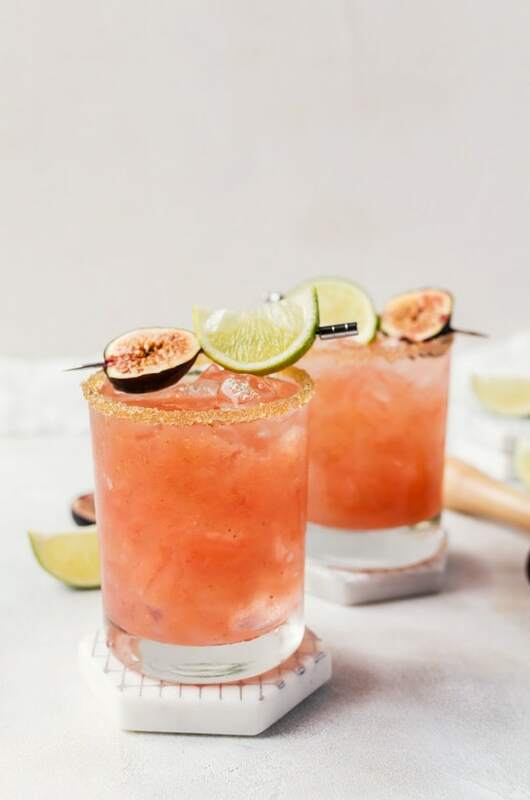 My contribution are these fresh fig margaritas. My local produce store sometimes carries fun produce that I love to get and play with. A few times they’ve stocked passion fruit, dragon fruit…right now they have jackfruit available. They regularly bring in guava and cactus leaves (which are great in a smoothie by the way) And on good days they will carry one or two types of fresh figs. They tend to be a bit pricey, but they are always worth the splurge for me and I grabbed a few containers. Since I wanted to really celebrate the figs for their amazing flavor and color when they are fresh, I decided to make a fresh fig syrup/puree. For this, I simply placed cut figs, a touch of lavender, and sugar together and let it sit overnight the same as if I were to make shrubs. Only this time I mix it with tequila instead of apple cider vinegar. The result is a really lovely peachy color puree/syrup. You do end up with quite a few fig seeds, but they don’t add much to the texture so you can leave them in or you can strain the mixture to remove them. This slower process keeps the fresh flavor of the fig without making it taste jammy which is nice, but will give more of a Fig Newton-ness to the cocktail. Instead the flavor is more mild and better complements the citrus flavors in the lime and triple sec. I added a small amount of lavender to add floral notes to enhance the Spring profile. So the fresh fig margarita does indeed taste…fresh. I recommend making larger batches of the fresh fig syrup to have on-hand as you need it. The syrup will last for about five days in an airtight container in the refrigerator. 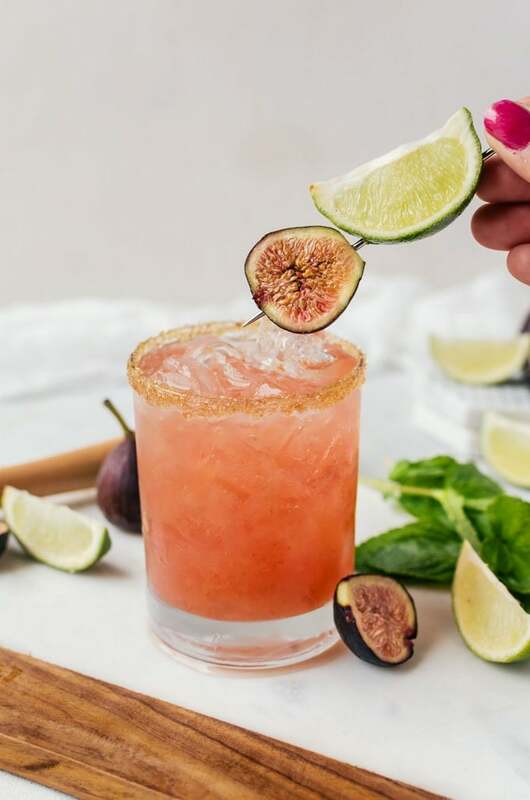 This fresh fig margarita is going to be the highlight of your Cinco de Mayo and summer barbecues. When you have one of these in your hand, everything is right in the world. So grab a glass and celebrate (responsibly) with me! Add the cut figs, lavender, and sugar together in a bowl. Muddle well. Cover tightly and leave in the refrigerator for at least three hours, preferably overnight for the best results. Strain the mixture through a fine mesh strainer, pressing down as much as possible to get every bit of liquid. Add honey to a plate, and a mixture of turbinado sugar and salt to another. Dip the mouth of your cocktail glass into the honey and then the sugar/salt mixture. In a cocktail shaker, muddle the mint leaves with the fig syrup, lime juice, triple sec, and tequilla. Add a few ice cubes and shake vigorously. Oh wow Amanda! 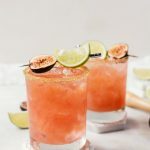 These margaritas are so darn pretty and I love the little bit of texture the fig seeds add to the drink. Figs can be a bit hard to come by in my area and when the local market gets them in. . .well…they aren’t that great. I’m always jealous of others who are able to get their hands on fresh, plump figs. 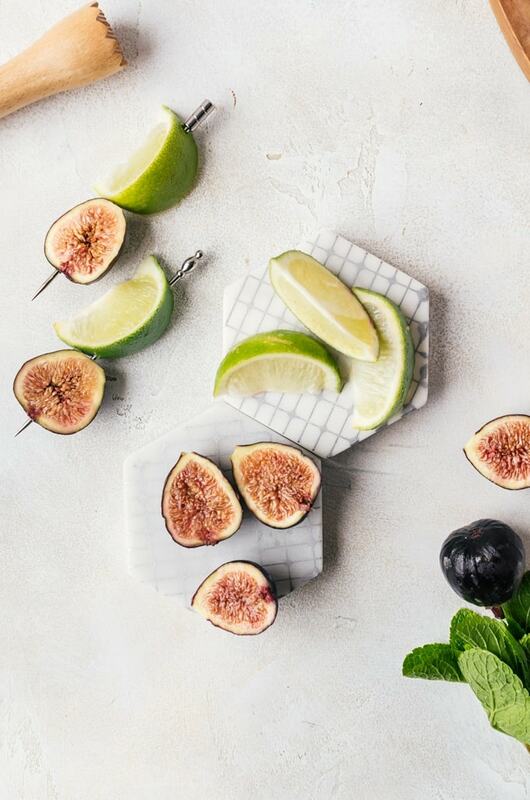 The figs are such a fun twist on the traditional margarita mixers! Love it. Just made these for my sister and her family while they were visiting us in fig-happy Los Angeles. Everyone loved them. This is a perfect summer cocktail.